Sonakshi Sinha is currently neck deep with her promotional work for Kalank. Karan Johar's multi-starrer that also stars, Alia Bhatt, Varun Dhawan, Madhuri Dixit, Sanjay Dutt and Aditya Roy Kapur in lead roles is essentially a romantic drama set during the partition era. Karan Johar's love for grandeur has reached a new height with his next venture and there's so much to gush about it. From such gorgeous faces to their nostalgia-inducing styling and rich movie sets, Kalank is loaded with many wow factors and Sonakshi's styling for its promotional activities also comes under the same category. Kalank Designer Manish Malhotra Reveals Some Crucial Details about Styling Madhuri, Sonakshi and Alia for this Period Saga. With the help of her ace stylist, Mohit Rai, Sonakshi was able to stun in most of her outfits. From traditional suits to elegant sarees and fusion wear, she donned different silhouettes for varied appearances and manage to nail most of them. We are personally digging her red outfit from the trailer launch that was filled with its matching thread embroidery. It was conventional yet chic. There are days when she's heavily criticised for her wrong and horrendous fashion outings. But we're glad for she gave us no reason to complain this time. 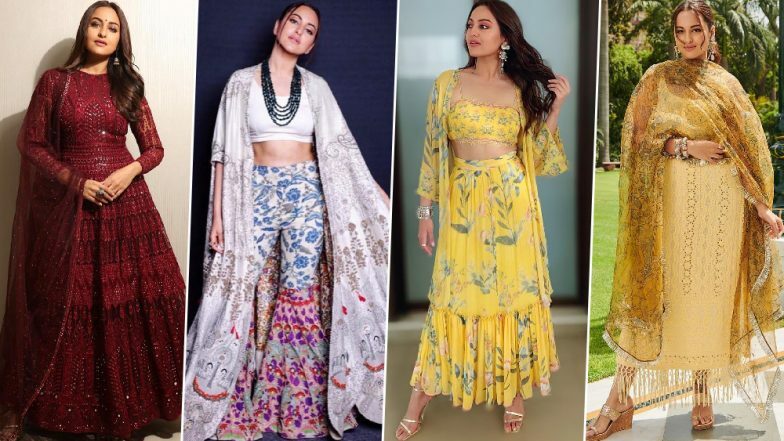 Below are some of her sartorial moments from the Kalank promotions and we adore all of them. Have a look... Kalank Star Alia Bhatt Makes an Honest Mistake and It Is the Cutest Thing on the Internet Today, Ranbir Kapoor Are You Listening? Sonakshi's style offerings were distinctly different than Alia's and it was refreshing to see such stark differences. Though they preferred a mix of both traditional and modern silhouettes, their individual style moments were whistle-worthy and truly commendable. Kalank is all set to hit the screens on April 17, 2019.